"sunday - nothing. monday - first day after the weekend. tuesday - this week is going to take forever... WHAT. THE. F*CK. ...........saturday. 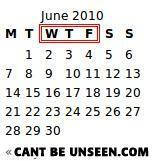 even the calendar says "WTF" after monday and tuesday. Alright, this is starting to turn into a dad joke.